Magnifique. A lot of these remind me of the cover of Three Farmers on Their Way to a Dance by Richard Powers, which is a decent novel partly about WWI. How is it that this is just getting posted now? I remember seeing this elsewhere many many many moons ago. Very cool stuff though. Perhaps not the exact same link, but pretty much the same content. Great photos. Our whole vision of that time is shaped so much by b&w photos and films that the color seems unreal. 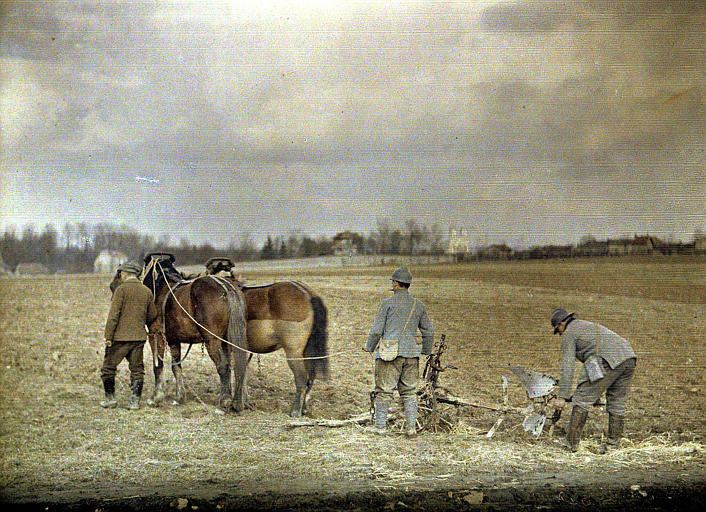 The New Yorker ran a spectacular piece on WWI photography by Susan Sontag a few years back. One thing I really wonder... how the heck do they decide on some of these colors? In this one, for instance... where on earth did they get that shade of red for the hat color? I mean, maybe it's real and historically accurate, but it looks SO fake. I have a hunch that if you showed this picture to that guy, he'd fall over laughing. Oh and briank... the previous link you posted is 404 Not Found. So there's no easy way to determine whether or not it's a dupe. Can't really blame Shawn for that one. Malor, the link works for me. how the heck do they decide on some of these colors? Unless I am wrong, they didn't *decide* anything related to color, but rather took the same picture 3 times using 3 different color filters and then combined the negatives. Maybe you have too much of a language barrier to deal with, but I found the interface far from "horriable", specially if you consider you're linking directly to page supposed to opened as a second window (from this main window - the 1918 photo sections in under "Visite Guidées", "Les Autochromes de la guerre 14-18". There are other interesting sections there). For what it is worth, the best way to view the (awesome) photos seems to be by author. Just click on their names in the top-right and you do to a page with nice thumbnails for every photo from that author. Malor, magullo: These photos are Autochromes - full-color photographs, not colorized black-and-white, and not triple-exposures. This page (from previous MeFi post) includes some basic history of Autochromes. I expect the reason we're not more familiar with Autochromes today is that they were expensive, cumbersome, and delicate, and that there probably was no cheap/easy way - or maybe no acceptable way at all - to make duplicates or prints. Malor -- if you read the MeFi thread rather than just the original link in the FPP, there are links to the same stuff. I'm not trying to make a big complaint about it, just noting that it's been covered before. Too bad there isn't more like it, actually. Can anyone shed any more light on Autochromes? I know vaguely what they are and how they work with starch grains and dye but it would be great to know more (yes, I looked at that link). The colour - is it more a question of being faded than being inaccurate compared to a more modern process? Any more archives of them? Wow! Some perfect postcards here. The beauty abounds. 1) The dye colors used (reddish-orange, green, and bluish-purple) were somewhat odd. They often produced pleasing photos, but I'll bet they were never very accurate, color-wise. 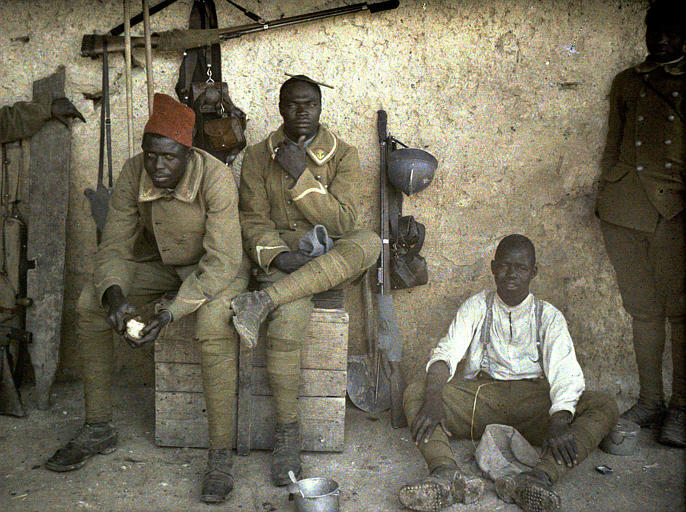 2) And the color accuracy can worsen as an Autochrome ages, too. 3) Some of the details about the process as practiced are educated guesses at best. The page also says: ...if you could see an original well preserved Autochrome today... [it would] appear as though [it was] processed only yesterday. Which (judging from the example provided) I disagree with. The colors have an artificial, unearthly sort of feel to them. While sometimes quite beautiful, they don't look like modern photos, IMHO. Early color technology was very limited in the spectrum of colors that could be reproduced. I'd say these are easily as accurate as could be produced in that era. Compare, for instance, these images to the early 2-strip technicolor movie process from the mid-to-late 20's. These WWI images look far more realistic. Heck, compare these to any color snapshot from the 50s or 60s. Sure, the more recent images have a greater range of color, but I wouldn't call them accurate, per-se. Given the volitilty of the early processes, I would be willing to accept the suggestion that a fresh, well-preserved Autochrome could actually look very nice indeed. I found these beautiful. Bombed ruins with marvelous lighting. The History Channel had a four or five part miniseries on WWI last week where all the footage was colorized. It was great educational viewing, and the photos and film clips were mesmerizing. All of you who enjoyed this site and get the History Channel should try to catch the reruns.